The Woodford Reserve Distillery in Kentucky, has announced the launch of latest release in its innovative Distillery Series. 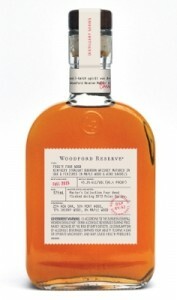 Woodford Reserve Frosty Four Wood (45.2% ABV) is a unique batching of mature Woodford Reserve bourbon, aged in American Oak and finished in barrels made from maple wood, sherry wood and port wood. Developed by Master Distiller Chris Morris, the Distillery Series which launched in 2015 with the Double Double Oaked and Sweet Mash Redux expressions, is said to showcase Woodford Reserve’s continued commitment to providing an unmatched whiskey experience and leading the spirits industry through innovation and craftsmanship. The original Four Wood whiskey, in the 2012 Master’s Collection, was exposed to record-low temperatures during the 2013 Polar Vortex, resulting in flocking, or mineral precipitation. Filtration techniques produced a more fruit-forward whiskey with maple hints. Woodford Reserve Frosty Four Wood, is now available from the distillery and specialist retailers for a RRP of $49.99 for a 375ml bottle.